Tonight's 6 miler turned into a 7 miler (ok, ok, so the mileage is a little off...it's 6.85 miles to be precise). The trail was not as busy, despite the cooler temperature just PERFECT for a run. 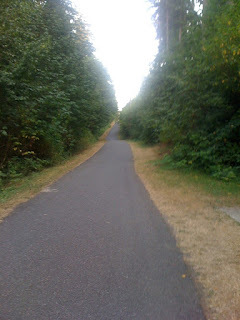 :) It was weird that some parts of the trail were covered in leaves and I thought to myself "COME ON, it's only the beginning of August, Soos Creek! "...there is plenty of time to turn into Fall when September hits. But it was a beautiful run, nonetheless. One thing was different though: I ran sans music! EEK! This was prompted by my coworker/friend/fellow runner, Alison, who says that I may be too dependent on it. So I said, ok--what the heck. Might as well try running without constant tunes. I mean, how hard could it be? High school XC didn't come with a soundtrack (although it felt like it should've at times). The result: the nature sounds were very awesome and it reminded me of running in Cape Cod (sigh), so it wasn't that bad. BUT (and this is a big but), there was one sound that I wanted to "mute" so badly, but couldn't...my breathing. GAH. I seriously cannot STAND the sound of my breathing. It's awful! That's all I could concentrate on, despite trying to think of my surroundings. I tried to slow down my breathing, or try a different "rhythm" but that didn't work out. Apparently passing out in the middle of a bike trail is not the greatest of ideas. Oh well. So, I toughed it out and started a decent groove of strides and breaths. Eh, I tried. I think I'll stick to my playlist, but I'll try running without it every so often. *Side note:* What I love about being around other runners is that, in passing, they wave or say hi. It's like the "brotherhood" between motorcyclists when they wave/nod at each other. It's fun! One thing that I didn't like about tonight's run...the perfume. There were these two couples (not together, but a mile or so apart) where the woman was wearing the sweetest smelling flowery perfume that just made me want to gag! I mean, SERIOUSLY. It lingered! I could smell it for a quarter mile. Yuck. And this happened twice! This is the reason I skip my normal fragrance spritz the day of a race, as a common courtesy for the other runners. ;) No one likes to smell a perfume so much they can taste it. Here's a pic of what I like to call the "Hell Hill" that's at the end of my run (last half mile or so). GAH, it's tough, but I've kept my stride up that hill and haven't walked it once. Woot! 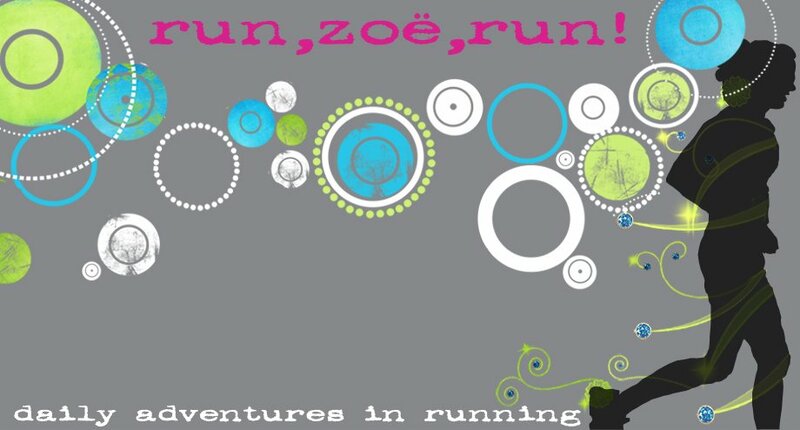 Hi Zoe - thanks for popping by my blog! Congrats on such a great run! AND well done on not getting too fed up with the lack of music - that's a tough ask when you've always had it! I noticed the same thing. The weather was perfect and I hardly saw anyone out there. Also, a couple days ago I noticed the leaves on the ground, too, and thought, what the hell? Good job on kicking that hill's a**!